That’s it, folks. 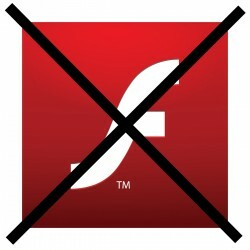 Adobe Flash Player for mobile devices has officially packed up its bags and walked out the door never to be seen again. Of course, Flash for desktop operating systems will live on (and probably not all that well), but Adobe has decided that Flash on mobile devices just isn’t in the cards. Many critics may think that the sole reason behind this was that Apple didn’t want Flash running on iOS. This was a reason, but not the reason. Long live HTML5! It’s definitely a sad day for Flash mobile, but I’m excited to see what Adobe has in store as far as HTML5 developments. Amidst of all the recent announcements from Google comes a lesser-known feature that’s available now in Google Labs. It’s a small service called Swiffy, and it will convert SWF (the file format for Flash) files into HTML5 versions for use in most modern browsers like Chrome and Safari. Google says the process works by first converting the SWF file into a JSON file, then rendering it using HTML, SVG (Scalable Vector Graphics), and CSS (Cascading Style Sheets). The result is a complete HTML5 file with a size that’s just slightly larger than the original SWF file that was converted. Of course, we’re all probably thinking that Swiffy would make a great tool for developers to use to develop and port content for iOS and other devices without Flash capabilities. Obviously, Swiffy is still in its early stages, so it can’t convert every SWF file under the sun just yet and Google doesn’t know if it’s going to turn Swiffy into an open-source project. Either way, Swiffy is waiting and ready for you to begin your Flash-converting monstrosity right now. No, that is not a typo. 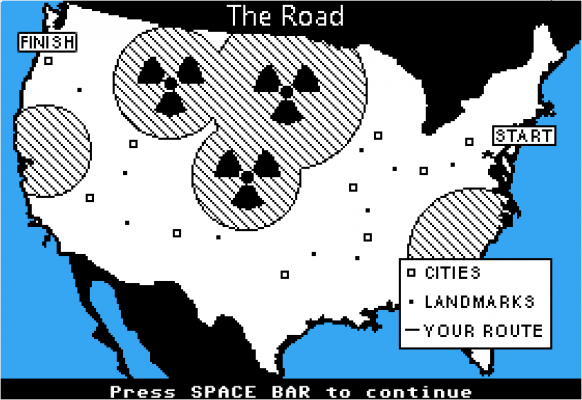 If you grew up in the 80s or 90s (and maybe even if you didn’t) you probably remember playing some version of The Oregon Trail, likely during your early years of school. Advertised as an educational game, to children it was more an excuse to shirk classwork in order to hunt unnecessarily large amounts of game (only able to carry back 200 pounds? 1200 pounds of buffalo should do it!) and see if it’s possible to make it to Oregon stocking nothing but bacon. Apparently when the zombie outbreak occurs, North Dakota gets nuked. 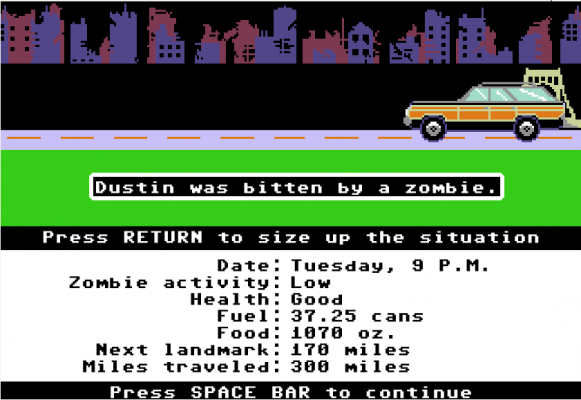 The Organ Trail is a re imagining of the classic game, except set in the present day and with zombies. It features throwback graphics and classic controls (no mouse here, just selecting numbers from a menu). Instead of contracting dysentery, party members might come down with a bad case of the T-Virus. Zombies are your prey instead of rabbits and elk (though I don’t think you’ll want to carry any back to eat), and forget about fording rivers, on the Organ Trail you’ll ford seas of zombies. If you remember how The Oregon Trail played, you’ll feel right at home. Instead of spending money at the beginning to gear up for your trip, you spend hours scavenging for certain supplies. Once on the road in your station wagon, various random events, both good and bad, interrupt your progress. 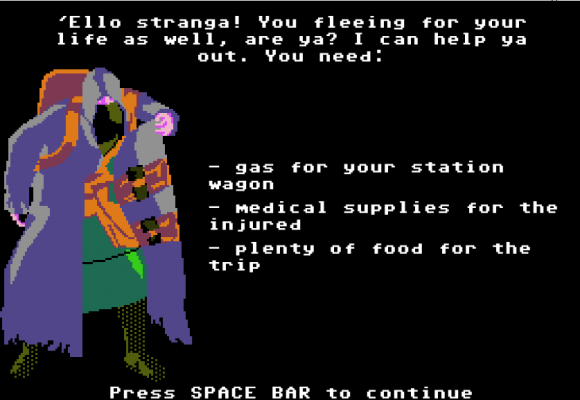 You might find extra gas in an abandoned vehicle, or yes, one of your party members might get dysentery. Cities and landmarks are interspersed along the way, giving you a chance to trade with others or buy extra supplies. Once you get near the end of the trail, the game becomes a balancing act between your dwindling supplies (do you trade your last remaining spare tire for some desperately needed food, or just cut the rations of your party members?). Though still technically in Beta, Organ Trail offers plenty of fun and an excellent way to burn about an hour. My final score upon arriving in Oregon was 2290, are you able to beat that? Let us know in the comments section! If you liked The Organ Trail, look back at previous Friday Fun articles and see if anything catches your eye! This week’s edition of Friday Fun is a bit of a departure from the usual games we feature. While it’s still technically a Flash game, The Day is more interactive fiction than it is an addictive time waster like most Flash games. Gameplay is incredibly simple, and much greater emphasis is placed on atmosphere and storytelling. You play the role of Tia, a young girl celebrating her birthday. 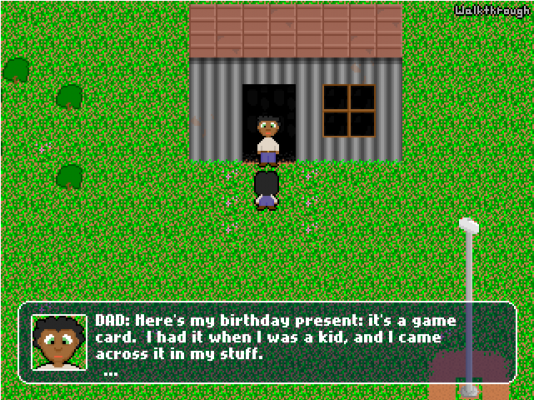 As a present, your dad gives you a card from a trading card game the local kids play. Shortly after, your friend stops by to explain the rules. Don’t worry, there’s no Magic: The Gathering level of depth to be found here, the rules aren’t much more complicated than War. Your goal is to battle each child walking around the town, acquiring their cards when you beat them. You start to notice right away that things aren’t quite as they seem. Why did your father warn you about going near the trees? Why are their security cameras watching your every move? Why does a child’s card game feature such violent imagery? With such simple gameplay, you can devote most of your brain to pondering these questions. The Day features standard pixel art, but it’s the music that really stands out. The jovial tune looping in the background provides contrast to the strange imagery presented. At one point in the game, spooky background noise makes the atmosphere that much creepier. There are two ways to ‘win’ the game, and they’re mutually exclusive (you can’t do them both in the same playthrough). Don’t worry, though, you won’t spend hours on this one. You should be able see both endings in about fifteen minutes of total playtime. After finding both endings, commentary from the creator unlocks in the main menu. The commentary gives some insight into what you see during the game, and leaves you with more things to think about. If you enjoyed The Day, check out the rest of our Friday Fun articles! Friday Fun! Why Do Homework When You Can Procrastinate With Liferaft: Zero? With school starting for many of our readers (myself included), what better way to celebrate than with another edition of Friday Fun? After all, Flash games are the ultimate procrastination tool! Liferaft: Zero is a devious blend of the setting from Portal, the acrobatics of N, and the frustrating difficulty of Jumper. You play the role of a series of clones, hopping through obstacle courses under the watchful eye of mysterious scientists. At your disposal are a standard jump, a wall jump to reach higher areas, and a grappling hook that can connect to specific points on the map, allowing you to swing across long distances. If you impale yourself on one of the many spikes sprinkled liberally throughout the levels, you’ll respawn back at the beginning as one of your numerous clones with your previous body remaining on the map as a gruesome warning to your future selves. The goal of each of the 30 levels is to ring a bell located somewhere in the level. Sounds easy, but ringing it is the simple part; getting there is where the fun is! On most of the levels you’ll also find a piece of candy, usually in a pretty difficult area to reach. Getting several pieces of candy unlocks bonus levels. Make no mistake, this game is hard. 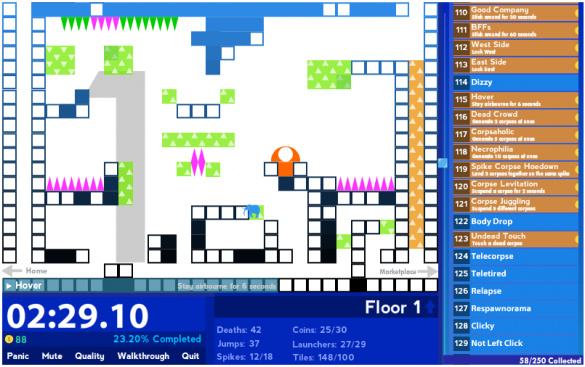 The first fifteen or so levels are relatively easy, but the difficulty skyrockets quickly. Don’t even think about attempting to grab the pieces of candy in the later levels on your first time through. Not only do you have to climb into whatever nook or cranny the candy is in, you then need to make it to the exit without dying. If you’ve played the freeware game Jumper, you might start getting flashbacks. Thankfully, Liferaft: Zero has a charm about it that diffuses some of your frustration. The humor in the game is similar to that found in Portal. Scientists peer at you through windows in the background. A line of future clones is visible, waiting patiently to be sent to their deaths. When the scientists talk to you, they address you by what number clone you are. At the beginning you are #001, but by the end you’ll likely be addressed by a number in the hundreds. Manage to beat the game yet? I haven’t. Tell us about your experience below! If you’ve played a game on a major gaming platform in the past few years, chances are you’re familiar with achievements. Games on the Xbox 360 have them in the form of a Gamerscore, where certain actions in games gain you points that are displayed in your profile. The Playstation 3 has platinum, gold, silver, and bronze trophies. Most Steam games come with achievements that can be earned. Some people go to great lengths earn achievements, and even play terrible games just for the easy Gamerscore they can earn. If you count yourself among those ranks, or if that “ten more minutes of Civilization” has ever turned into six hours, chances are you’ll love Achievement Unlocked 2. Achievement Unlocked 2 is a direct sequel to, you guessed it, Achievement Unlocked. Don’t worry if you haven’t played the first game. While it’s fun as well, enjoyment of the second game doesn’t depend on it at all. The gameplay in Achievement Unlocked 2 is incredibly simple: while controlling your elephant avatar using the arrow keys (Why an elephant? Why not? ), you attempt to traverse the game’s levels and unlock all 250 achievements. Achievements range from the absurdly easy (“use the Internet”), to the slightly trickier (“collect all the coins on all the levels”). Chances are you’ll unlock at least ten achievements within your first ten seconds of play. Coins collected around the levels can be used to purchase ‘DLC packs’ in-game, unlocking more levels to earn more achievements. If you have friends who share your neurotic urge to unlock achievements, Achievement Unlocked 2 also sports a co-op multiplayer mode. It’s pretty basic, but multiplayer is never a bad thing, right? While you’ll probably start out laughing at the absurdity of it all, it’s hard to deny the draw of the game that keeps you playing. You know the achievements are completely meaningless, yet you still keep trying to unlock just one more. What started out as a quick five minute break from work quickly turns into an hour of mashing the arrow keys. Eventually you realize the futility of trying to get all 250 achievements, but if you do manage to unlock them all I applaud your perseverance. I didn’t have the willpower to keep going. Most of us use Adobe Flash, that’s simply a fact of the internet. YouTube, Hulu, Pandora, and dozens of other sites currently use Flash to provide you with interactive media and applications, and until HTML5 (hopefully) gives us a viable alternative, we’re stuck with it in many ways. Don’t get me wrong – I don’t mind Flash. 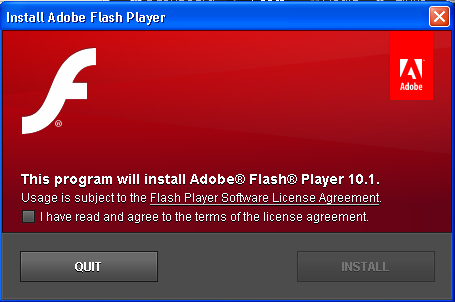 What I dislike is when Adobe starts forcing me to install an intermediary application, Adobe DLM, to install Flash instead of directly installing the software. For those of you that have been on the internet for a while and remember “download manager” applications, when was the last time you needed one in the age of high speed internet? Step 1: Instead of installing Flash from the normal installation page, head to the Flash troubleshooting page. You can alternatively get to this location from the normal installation page by clicking the link “click here for troubleshooting information” as shown below. Step 2: On the troubleshooting page, click the link that says “Troubleshoot Flash Player installation”. I haven’t tested this in other operating systems, but I was presented with a specific Windows link. Please post in the comments if you’re using another OS and see something different. Step 3: Skip all the steps presented on this page and instead click the link that says “Download Flash Player with the manual installer”. Step 4: Select the correct file for the browser you are using. One file is for Internet Explorer, the other is for all other browsers. Now just install Flash as usual. It was a little more work, but now you are only installing the software you wanted to use in the first place. Hooray! If you’re using Firefox and have installed Flash in the past, you can check to see if Adobe DLM was installed by going to Tools –> Add-ons and locating it in the list. From this menu it can be disabled and/or removed. 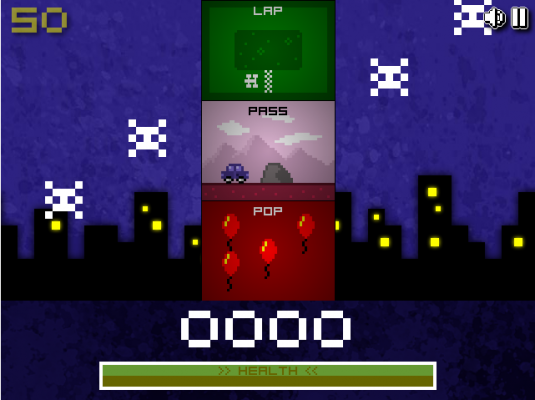 In this week’s Friday Fun, I bring you a Flash game with a bit more depth than previous entries. Pixel Legions takes the complexity of most modern real-time strategy games and boils it down into its most basic form, perfect for the Flash game format. In Pixel Legions there is only one unit type, the humble pixel. 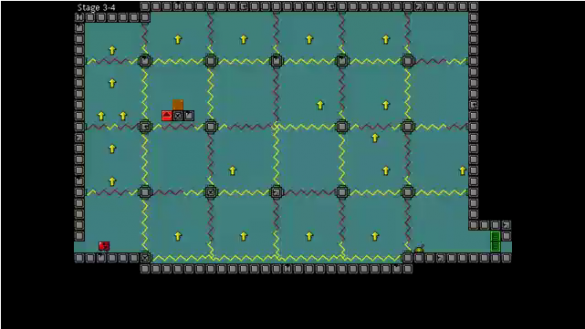 Groups of pixels are spawned in regular intervals at your square base. Pixel groups can be directed by clicking on a group and then clicking on a destination or by clicking and dragging for more complex routes. When two pixel groups of opposing colors get close enough to each other they join in battle. 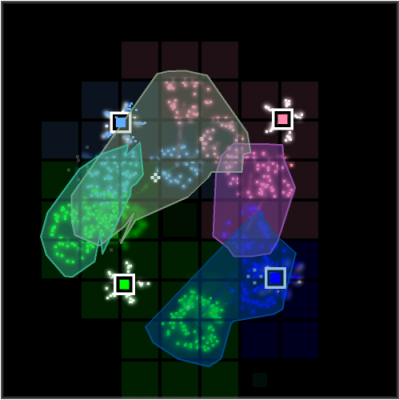 The goal of each level is to eliminate the opposing colors’ pixel spawning bases. Many of the later levels start you at a distinct disadvantage to the opposing colors, but there are ways to tilt the odds back into your favor. 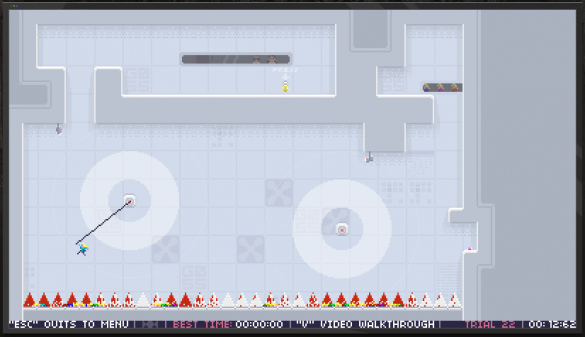 Flanking groups of enemy pixels by attacking from multiple sides give your pixels a combat bonus. You can also halt enemy pixel production by directly attacking their base. On levels with multiple enemies you can bide your time, building up your own army while your opponents decimate each other. Several levels introduce obstacles that alter how the game is played. 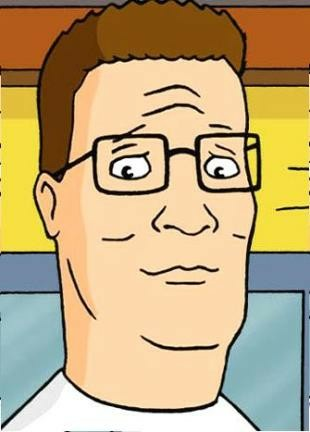 For example, some levels have a “King of the Hill” area (no, not that King of the Hill). Position your base here and you will benefit from increased pixel production and a boost to your existing army’s strength. Pixel Legions manages to provide enough strategy and tactics for RTS fans, but also keeps thinks simple enough for those not used to the fast pace of the modern RTS game. Kick back and relax, it’s Friday! What better way to pass the time at work than with a Flash game? Morplee follows the WarioWare format of throwing mini-games at you and seeing how fast you react. You’re given 60 seconds to complete 25 mini-games, running the gamut from frantically clicking as fast as you can to solving simple math problems. The twist is that the mini-games are stacked on a tower, giving you a view of three at a time that you can play in any order you choose. On top of that, Space Invader-like enemies fall from the sky. Shoot them with your mouse before they land and start sucking your lifeforce. Take too long or lose all of your health and it’s Game Over! There are slight variations to some of the mini-games, so even if you have one figured out you’ll still have to think quickly before you click. You’ll probably be able to finish the game in ten minutes or less, but those ten minutes will be filled with frenzied mouse movement and clicking as you try to save your home planet from the invading aliens. I finished with a final score of 3034, can you top that? More information on the NVIDIA Tegra line can be found here.